By ferry or by bridge, you will enjoy getting to PEI. Charlotte's Shore (also known as the South Shore) is the name for the coastline region between Charlottetown and Summerside. Visitors' first view of Charlotte's Shore is often from the 60 metre high centerpoint of the 13 km (8.1 mi.) 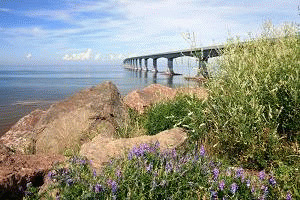 Confederation Bridge (built in 1997) which joins New Brunswick and PEI. Charlotte's Shore, the economic and political centre of Prince Edward Island, is spread out before visitors to PEI, complete with red cliffs and gently rolling farmland. An 1860 architectural theme can be found along with The Visitor Information Centre that introduces visitors to PEI, the Official Island Gift Shop, and a park, in Gateway Village at the foot of Confederation Bridge. Chelton Beach Provincial Park, a little ways up the road, is a dune beach that offers swimming in the Northumberland Strait's warm waters. The Seacow Head Lighthouse was built in 1863 and is a good place for birdwatchers. The Kinkora area is a land of potato farms. Nearby, Scales Pond offers trout fishing amidst a network of nature trails. The Village of Victoria-By-The-Sea offers craft shops, a chocolate factory, and a seafood market. Hikers and mountain bikers in Summer, and cross country skiers in the Winter, will enjoy the Brookvale Provincial Ski Park. Port-la-Joye/Fort Amherst is a National Historic Site and displays information of the history of the first permanent European settlement on PEI. The grounds provide a picnic site and an excellent view of the Charlottetown Harbour. A little farther along the road enters the city of Charlottetown, the provincial capital. Down The Shore Long Term Argyle Shore 122 Shore Rd. The Beach House At Augustine Cove Long Term Augustine Cove 190 Cutcliffe Rd. Donna's Cottages Long Term Bedeque 1110 Fernwood Rd.